A nobordercamp took place in Cologne/Dusseldorf between 13th and 22nd of July 2012. 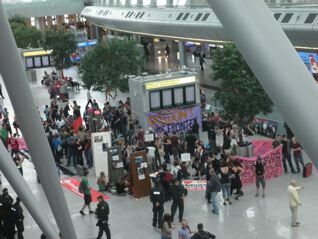 The main focus of protests during the camp was the airport in Dusseldorf because of its role for charter-deportations to Serbia and Kosovo. Financed by Frontex and organized with planes from Air-Berlin first of all Roma-families are affected by these deportations and find below a short report about our protests inside and outside the airport on 21st of July as the final big action of the nobordercamp.